Since I posted about “Manufacturing Resource Planning (MRP II) – ERP’s Embrio”, many reader of this site sent me email and said that they thought I posted about ERP software (= Enterprise Software), they thought it is all about ERP software package. This post is not a post about software. One more time: This is not a post about how to select software and install it on your computers. Rather, it’s about ERP system, a superior business processes in your company—processes that yield a competitive advantage. The answer is that Enterprise Resource Planning (ERP) is not software. One more time: ERP is not software. There’s a lot of sloppy terminology flying around today in the business press, and one misnomer is to label enterprise-wide transaction processing software systems as ERP. These software packages support effective resource planning and make much of it feasible, but they don’t truly do it. Plus these packages contain many business processes other than resource planning. Therefore, we need to trot out another acronym that does refer to software: ES. This stands for Enterprise System or Enterprise Software. In his book “Mission Critical“, Thomas H. Davenport describes enterprise systems as “packages of computer applications that support many, even most, aspects of a company’s information needs”. That makes sense to us. Now for another distinction: Not all ERP business functions are contained in the typical Enterprise Software (ES) suite. Similarly, the typical ES contains software support for business processes that are not a part of ERP. 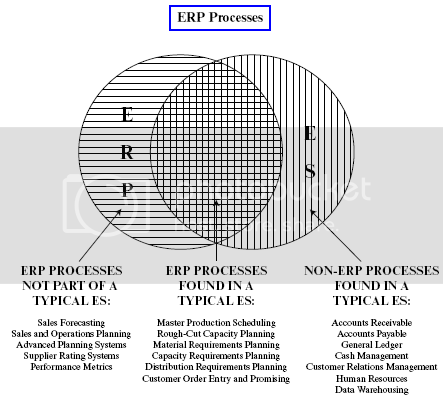 In below figure (ERP Processes), we can see that distinction graphically. Please note the three areas on that diagram. 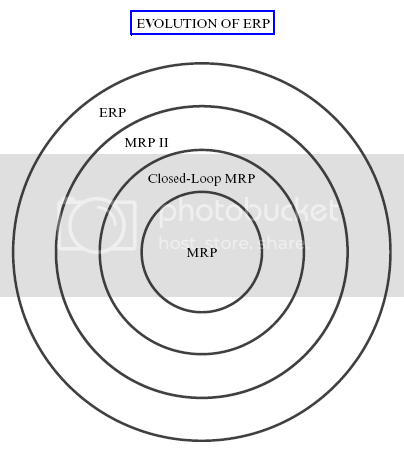 The rightmost part of the figure refers to those functions contained within a typical ES that are not part of ERP; while the leftmost area is for those ERP functions not normally supported by an ES; the area of overlap in the center references those ERP functions typically supported by Enterprise Software. What Is Enterprise Resource Planning And What Does It Do? Enterprise Resource Planning (ERP)—and its predecessor, Manufacturing Resource Planning (MRP II)—is helping to transform our industrial landscape. It’s making possible profound improvements in the way manufacturing companies are managed. It is a strong contributor to world’s amazing economic performance of the 1990s and the emergence of the New Economy. A half century from now, when the definitive industrial history of the twentieth century is written, the evolution of ERP will be viewed as a watershed event. Enabling people to run their business with high levels of customer service and productivity, and simultaneously lower costs and inventories; and providing the foundation for effective e-commerce. Enterprise Resource Planning is a Fortune 50 corporation achieving enormous cost savings and acquiring a significant competitive advantage. The vice president of logistics stated: “ERP has provided the key to becoming a truly global company. Decisions can be made with accurate data and with a process that connects demand and supply across borders and oceans. This change is worth billions to us in sales worldwide”. Enterprise Resource Planning is a purchasing department generating enormous cost reductions while at the same time increasing its ability to truly partner with its suppliers. The director of purchasing claimed: “For the first time ever, we have a good handle on our future requirements for components raw and materials. When our customer demand changes, we—ourselves and our suppliers—can manage changes to our schedules on a very coordinated and controlled basis. I don’t see how any company can do effective supply chain management without ERP”. That’s ERP. Here’s how it came to be. What do we have to get? This is called “The Universal Manufacturing Equation“. Its logic applies wherever things are being produced whether they be jet aircraft, cars manufacturer, sparepart industry, machine tools, chemicals, cosmetics . . . or Thanksgiving dinner. Material Requirements Planning simulates the universal manufacturing equation. It uses the master schedule (What are we going to make? ), the bill of material (What does it take to make it? ), and inventory records (What do we have?) to determine future requirements (What do we have to get?). MRP quickly evolved, however, into something more than merely a better way to order. Early users soon found that Material Requirements Planning contained capabilities far greater than merely giving better signals for reordering. They learned this technique could help to keep order due dates valid after the orders had been released to production or to suppliers. MRP could detect when the due date of an order (when it’s scheduled to arrive) was out of phase with its need date (when it’s required). This was a breakthrough. For the first time ever in manufacturing, there was a formal mechanism for keeping priorities valid in a constantly changing environment. This is important, because in a manufacturing enterprise, change is not simply a possibility or even a probability. It’s a certainty, the only constant, the only sure thing. The function of keeping order due dates valid and synchronized with these changes is known as priority planning. So, did this breakthrough regarding priorities solve all the problems? Closed-loop MRP has a number of important characteristics: It’s a series of functions, not merely material requirements planning. It contains tools to address both priority and capacity, and to support both planning and execution. It has provisions for feedback from the execution functions back to the planning functions. Plans can then be altered when necessary, thereby keeping priorities valid as conditions change. Sales & Operations Planning—a powerful process to balance demand and supply at the volume level, thereby providing top management with far greater control over operational aspects of the business. Financial interface—the ability to translate the operating plan (in pieces, pounds, gallons, or other units) into financial terms (dollars). Simulation—the ability to ask “what-if ” questions and to obtain actionable answers—in both units and dollars. Initially this was done only on an aggregate, “rough-cut” basis, but today’s advanced planning systems (APS) enable effective simulation at very detailed levels. Now it’s time to define Manufacturing Resource Planning. This definition, and the one to follow, come from APICS—The Educational Society for Resource Management. APICS is the leading professional society in this field, and its dictionary has set the standard for terminology over the years. • coordinates sales, marketing, operations, logistics, purchasing, finance, product development, and human resources. Its goals include high levels of customer service, productivity, cost reduction, and inventory turnover, and it provides the foundation for effective supply chain management and e-commerce. It does this by developing plans and schedules so that the right resources—manpower, materials, machinery, and money—are available in the right amount when needed. Enterprise Resource Planning is a direct outgrowth and extension of Manufacturing Resource Planning and, as such, includes all of MRP II’s capabilities. ERP is more powerful in that it: a) applies a single set of resource planning tools across the entire enterprise, b) provides real-time integration of sales, operating, and financial data, and c) connects resource planning approaches to the extended supply chain of customers and suppliers.